If you have been thinking about taking advantage of a day on the slopes without the crowds, turn your thoughts into action. Get over to Avie’s Ski / Sports by tomorrow—Sunday—by mid-day to sign up. A decision on the trip must be made by mid-afternoon tomorrow, so don’t delay if you want to take advantage of a mid-week ski and ride opportunity. And you should take that opportunity. Several inches of snow overnight tonight and into tomorrow will be gracing the hills of Vermont. 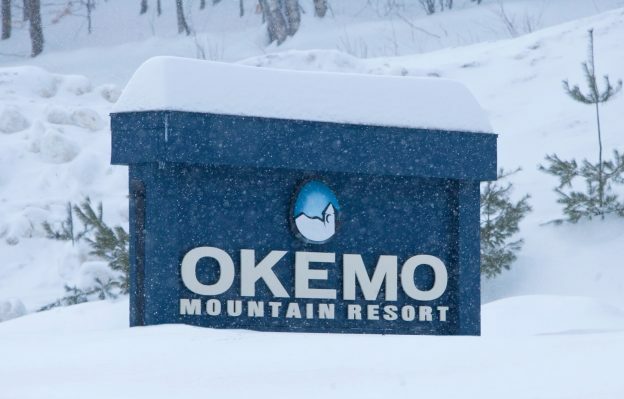 Then Tuesday and into early Wednesday more inches—as many as 8—will fall in the Okemo area. That means a lot of nice, fresh snow to play in. Hmmm, what’s that called? Pass along this information far and wide. Grab a friend and get over to Avie’s Ski / Sports and sign up for the Okemo trip this coming Wednesday. Be one of those fortunate ones on the bus to Okemo. You will not be sorry. Fresh snow. No weekend crowds. No driving. 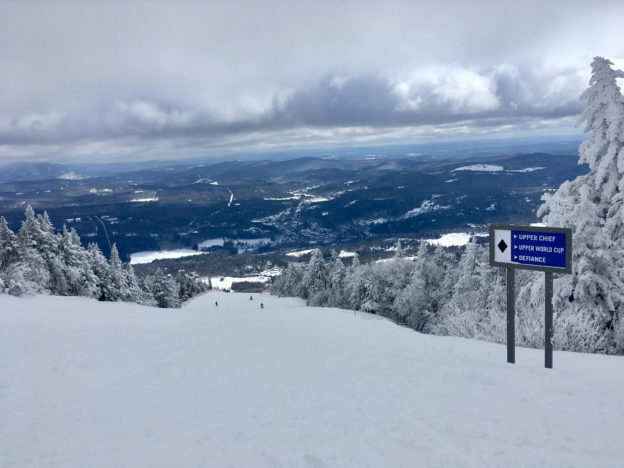 And no high cost—$99.95 covers the ride via coach bus to and from Okemo, and your lift ticket to a day of fun letting gravity have its way with you on the slopes. Sign up by tomorrow. Before mid-day. Okemo. Wednesday the 30th. See you then and there. 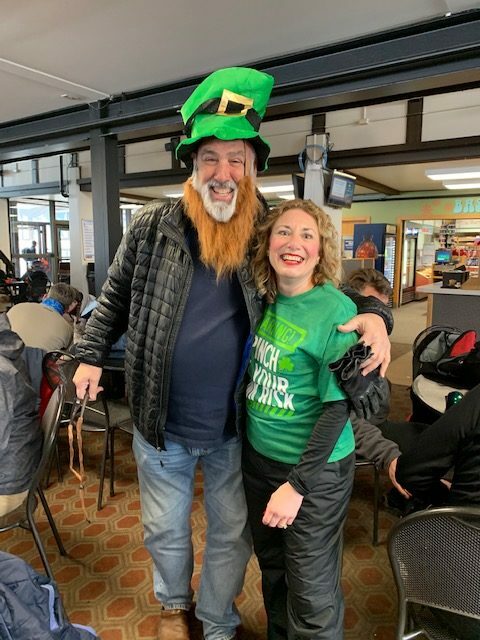 This entry was posted in Snow Conditions, Store Events and tagged bus trip, okemo on January 26, 2019 by Alan Desbonnet. It will officially be 2019 in a mere matter of hours. And it’s important to start off a new year with some good intentions. One of the intentions, in fact I would argue it to be the very best of intentions, should be to ski and ride. 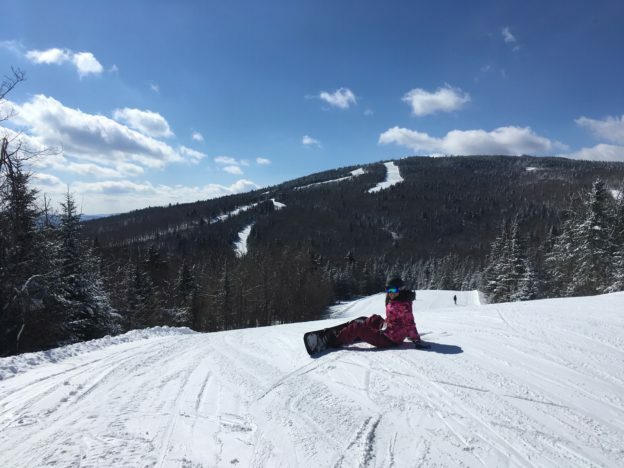 This Sunday, January 6th, the first Sunday of 2019, you can go to Okemo to ski and ride. Avie’s Ski / Sports has the first bus trip of the season headed to Vermont. And it will stop at Okemo. 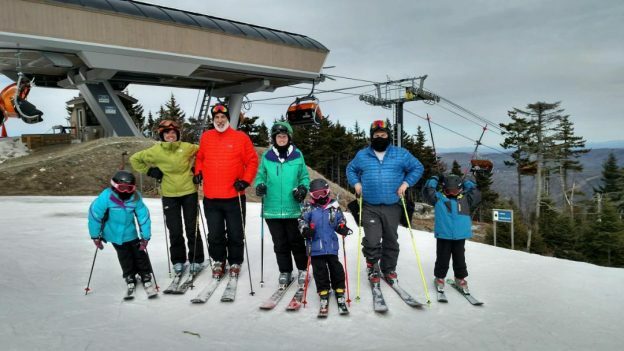 Today, New Year’s Eve Day, Okemo has 86 trails open to skiers and riders. Tonight they expect a few inches of snow to fall, and perhaps a few inches again this coming Saturday. Start 2019 on good footing, and go skiing and go riding. Do it at Okemo with other Avie’s Ski / Sport skiers and riders. The price for the trip to Okemo is a ridiculous $99.95. Window price for that ticket at Okemo is $106. You SAVE a few bucks on the lift ticket price AND you get a ride to and from the mountain. It sounds incredible, and it is. Go skiing. Go riding. Go to Okemo. Sunday January 6th, 2019. Avie’s Ski / Sports is closed on Tuesday, New Year’s Day. Get to the shop today, or Wednesday as soon as you can to be sure to get your seat on the bus to Okemo. Hope to see you Sunday. In the meantime, have a safe and wonderful ending of 2018 and start of 2019. 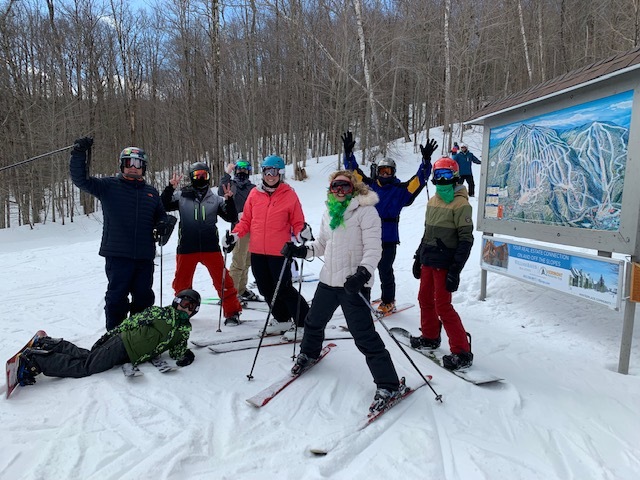 This entry was posted in Store Events and tagged bus trip, okemo on December 31, 2018 by Alan Desbonnet. Despite the fact Avie’s bus trips are done for the season, the urge to let gravity yank me downhill is still impressively strong. And my leg muscles are finally tuned to the point where at days end there is only a blissful ache instead of throbbing pain. So, I pointed north and had the great pleasure of being at Okemo yesterday. The resort is still 100% open, and there is plenty of snow, though they are done with snowmaking for the season. I was clicked into a pair of Blizzard Quattro RS skis, which thrive on firm-and-fast. So I started my day over on the South Face to hit it before the snow began to soften. I put down first tracks on every open, non-mogul trail. I had first and second tracks on Blind Faith. If you get the feeling there were few people there, you got it right. I stayed until about 10AM when the lower parts of the trails began to soften, and a steady stream of skiers and riders began to show up to take advantage of that softening. I worked my way over to the Main Face of the resort and hit all the classics—World Cup, Chief, Defiance, Nor’easter and Jolly Green Giant. These trails were still firm-and-fast, though the ice chip/”Death Cookie” mix—which graced most slopes on the South Face—had been skied over and chopped up to make the glide a bit less tooth rattling. I liked Chief and Nor’easter so much I did them each a few times top-to-bottom. I caught a big air (for me) on World Cup, and landed it! Usually airtime for me results in spectacular yard sale events, but not this time. I went next over to Solitude, and the surfaces there were very smoothed out. What is typically called “dust-on-crust” though the “dust” was a pretty good coating. I took a run on all the trails in Solitude, then headed back for a few final runs down Chief to make some big carves in the softening snow. It was a blast. There is plenty of snow left to have plenty of fun on. Yes, there are a growing number of hazard markers gracing the trails, and bald patches are sure to be turning up as the warming days march onward. But for now you can get the best of everything. Firm-and-fast to start the day with some high speed runs, mellowing in mid-morning as the snow softens, and then outright spring skiing and riding in “Hero Snow” late morning through mid-afternoon. Conditions are still phenomenal up north, so there is no reason to toss your gear in a corner for the spiders to play on until next fall. Get yourself up north again while the getting is good. And it is good. I’m still smiling, the morning after my day of play at Okemo. Since smiling and being happy are good things, I’m planning on doing it again. And again. Hope to see you out there. 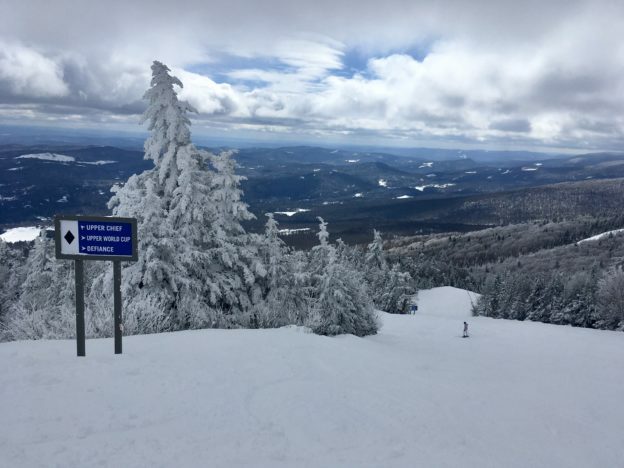 This entry was posted in Snow Conditions and tagged okemo on March 28, 2018 by Alan Desbonnet. 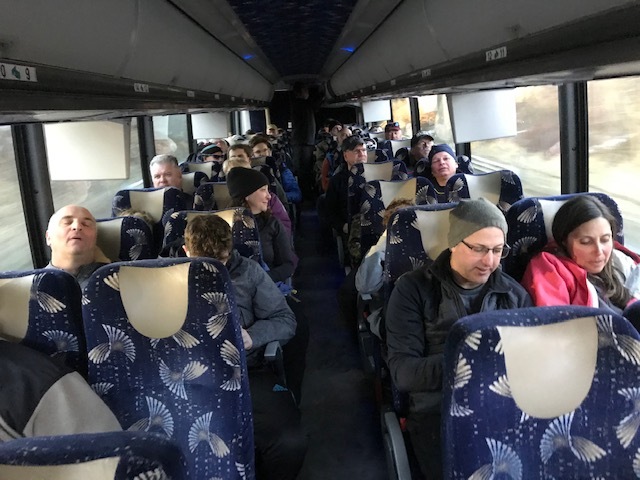 Fifty-three lucky people filled the bus for the last 2018 Avie’s Ski & Ride Trip. And they were very, very lucky people indeed. As is typical for the last trip, Okemo was the destination. The weather was typical January, though it was mid-March. The mood on the bus was typical; happy people getting ready for a day of playing in the snow. And what a day of play it was! 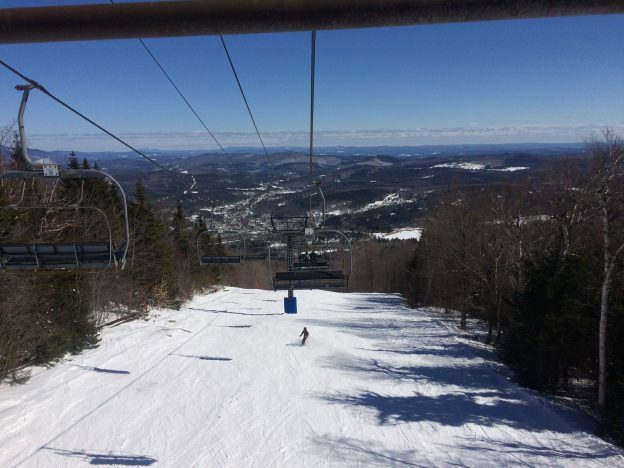 The definition of “Bluebird Day” in the dictionary has a picture of the skies at Okemo on the day of the trip. Brilliant sunshine from a brilliantly blue sky. All day long. The snow? Incredible! Firm and fast across the mountain early in the day, allowing for some quick runs down the mountain. South Face softened up a bit late morning, allowing for some exquisite carving fun. Woods, bumps, corduroy. It was all there laid out in abundance for all. And amazingly, the crowds were not so horrible in the morning, and by early afternoon skiers and riders went from trail’s end right onto a waiting chair. It was a perfect ending. If we needed something to complain about, it might have been that there was a touch too much breeze at the summit. But that really didn’t wipe the huge smiles off the faces of folks as they climbed aboard the bus for the ride home. Ted gave away a wealth of socks and scarves, koozies and cookies, hats and hoo-dads. There was even a movie that wasn’t Ice Age or Elf!! Can you believe that!? If you didn’t make the last Avie’s trip, you can still get in on some action in the snow up north. There is plenty there, and things look to stay colder than “normal” for the next week or so, meaning the snow will linger. It’s worth the trip. I had so much fun Sunday, that I went back up on Tuesday. It was just as good, but a bit less fun without the great bunch of people I skied with throughout the day. Get out there a few more times while the snow lingers. 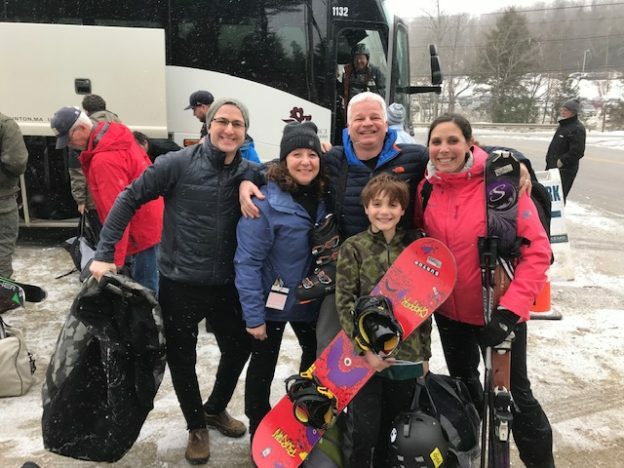 But if you are really dead set on calling it quits for the season, be sure to bring in your skis or board and have it “summerized.” This will ensure that come next year, when the Avie’s bus is pulling out of the parking lot with you on board, your gear will be ready to play hard. 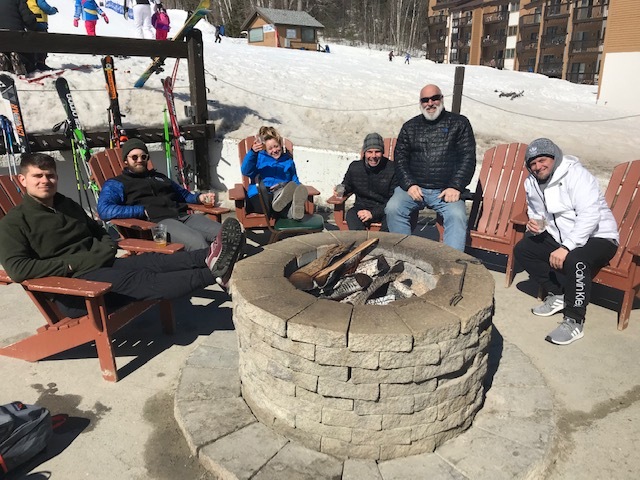 This entry was posted in Snow Conditions and tagged okemo, trips on March 21, 2018 by Alan Desbonnet. Today I had the pleasure of popping into Okemo and spending the morning cruising the mountain slopes. Like Killington the day prior, the newly fallen snow was plentiful, though Okemo had smoothed out many trails into delectable corduroy. They did leave quite a few trails ungroomed, so there was a nice diversity of snow across the mountain. My legs were still a bit sore from the day before, and it took a few runs in Jackson Gore to work out the kinks. Most of the trails in the Solitude area were ungroomed, and so not very busy. I stayed there for a bit, then wandered back to the main mountain, ending my day with a quad crushing run down Chief. There is abundant snow on all the trails, and if forecasts are on target then it will mostly stay there as temperatures warm a bit by day, then tumble again by night, preserving the snowpack. There are rumors afoot of another “dump” early in the coming week; let’s hope it’s true. Regardless, conditions are incredible right now. Most of the ungroomed trails will eventually get groomed over the coming few days to preserve and enhance conditions, so if you want the lumps and bumps, get out there soon. And if you like the groomers, get out there! Now! And to help you get there, you can hop on the bus from Avie’s this Sunday the 11th of March. The bus heads to Stratton for what I am sure will be a great day of playing in some very, very, tasty snow. Seats still available, but dwindling rapidly. However you can get there, get there. And enjoy some of the seasons most endearing conditions. 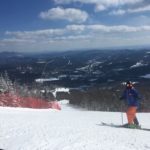 This entry was posted in Snow Conditions, Uncategorized and tagged okemo on March 9, 2018 by Alan Desbonnet. I had the pleasure of stopping at Okemo for a day of skiing yesterday. I thought I would pass along an update on how things are looking and what snow conditions are like. As you might expect, the massive rainfall late last week resulted in the loss of a lot of snow. Yes, there are patches of glacier ice here and there on the downslope edges of some trails. And yes, some trails were closed because the cover was too thin. That said, the trails that were open (85 of them) all had pretty good coverage, especially along the edge where the snow guns were located. A few trails were like crushed ice cubes, but they offer their own kind of fun as long as every trail isn’t that way. And they weren’t. Bottom line? While a step backwards was taken due to the rain, Okemo retaliated quickly and surely to make things skiable.The 6 or so inches they are expecting today will of course make things that much better. And things look to be staying cold, with the potential for another snowfall early next week. Of course, one of the nicest things about being at Okemo on a weekday was that there were no crowds competing for the snow. I made run after run after run, until about 10:30 AM, when I finally shared a chair of the heated 6-pack bubble lift to the top. While I didn’t lay down first tracks on any trail, I was second or third on many of them. My point here is, to be clear, Avie’s has a bus trip scheduled for Okemo on Wednesday the 24th of January. I very strongly suggest you be on that bus. Okemo is a great mountain with a good diversity of trails. If you want the opportunity to ski and ride that diversity without waiting in long lift lines, then constantly dodging an endless procession of people while sliding back down the hill, a Wednesday is a prime day for such a feat. 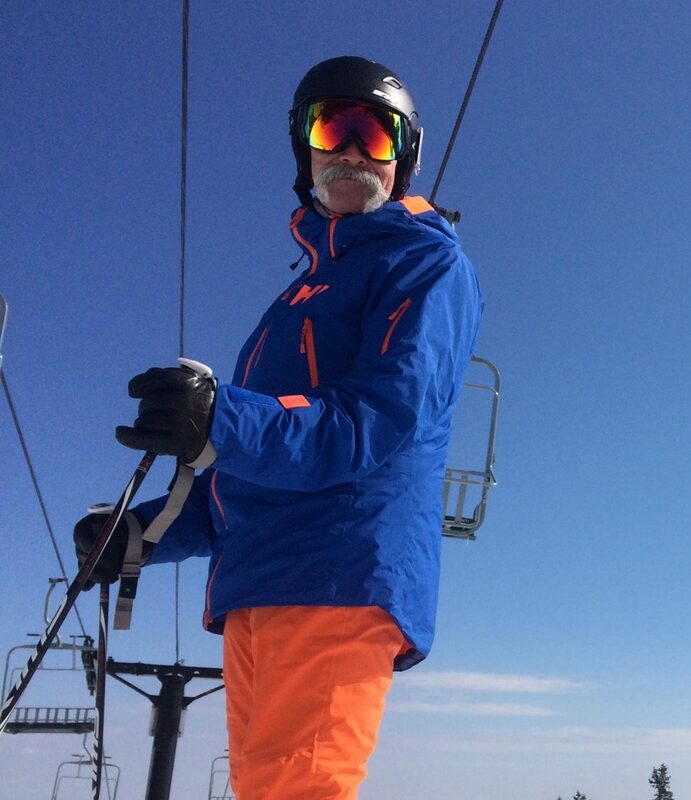 Join me on the 24th as we head to Okemo for a day of skiing and riding on the less crowded side. Conditions are good, and will be one heck of a lot better after this storm rolls through, and even better still if another happens before our visit. And if not, you know Okemo—known for it’s snowmaking and grooming—will be blasting snow all over the mountain between now and then. So stop by Avie’s and get your name on the trip list. And do it soon. You don’t want to miss out on a great weekday on the mountain. Weekend trips are fun, but weekday trips are, well, a lot more fun! 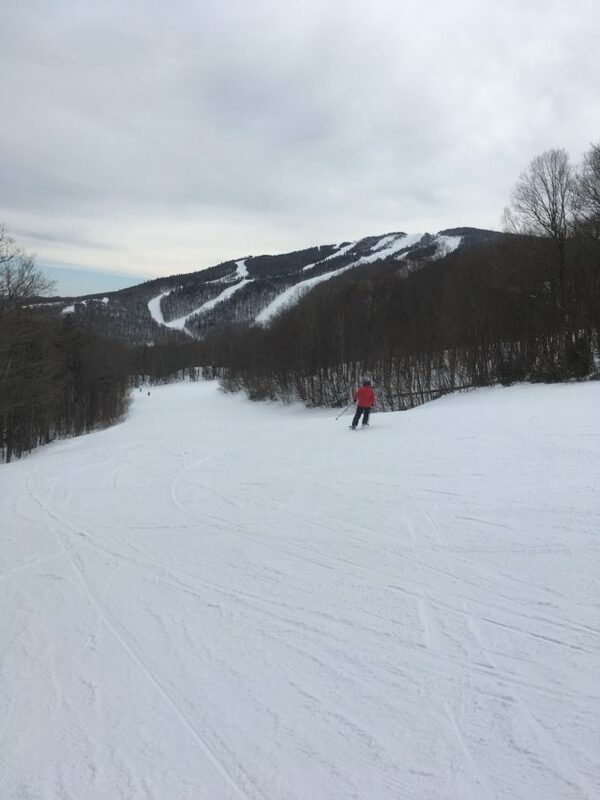 This entry was posted in Snow Conditions, Uncategorized and tagged okemo on January 17, 2018 by Alan Desbonnet. 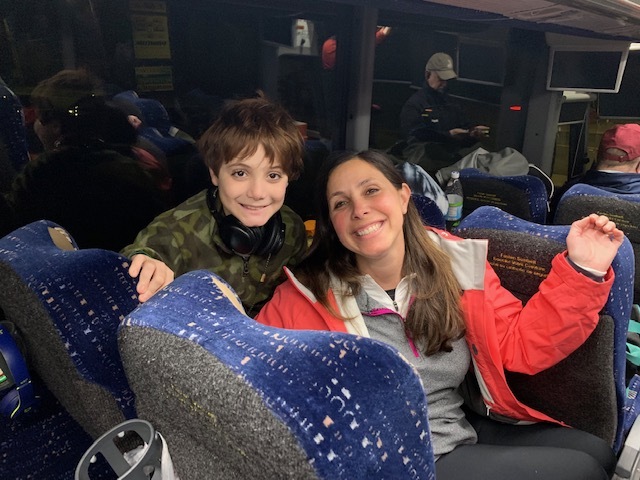 Avie’s Ski & Ride Bus Trips — Ready to Roll! 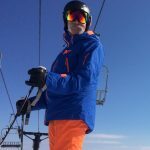 We just wanted to let you all know that the Avie’s Ski and Ride bus trip list has now been posted on the Avie’s website. I’ll get you there in just a moment. Unfortunately, most ski resort prices have now surpassed the $100 mark for a lift ticket. 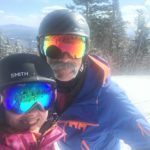 This entry was posted in Store Events and tagged killington, mount snow, okemo, riding, ski, Stratton, trips, waterville valley on November 22, 2017 by Alan Desbonnet.